HOUSTON (KTRK) -- Determining the admission rate for Rice University is in the preliminary stages, but the most recent numbers are in. For the Class of 2019, there were 17,900 applications, and Rice admitted 14.7 percent, according to Chris Munoz, Vice President for Enrollment at Rice University. "Our admit rate over the last eight years has gone from 26 percent to a low of 15 percent and that includes even the fact that we were growing," Munoz said. 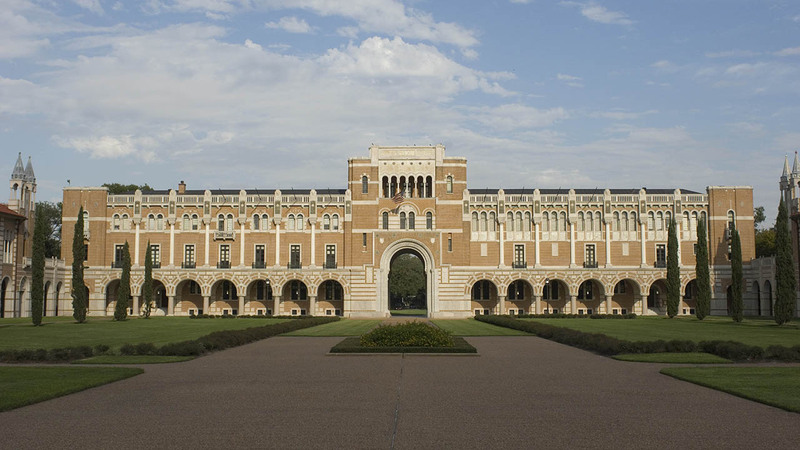 Rice is listed at 29th in desirability in the 2015 Top 100 Colleges by Student Choice, a report by GradReports. The metric considers only acceptance and enrollment, or yield, rate. "We're attracting incredibly well qualified students. The students who are applying to Rice, their qualifying academic records in terms of their grade performance, the rigor of the courses they've taken, and their test scores are just breathtaking," Munoz said. "This year's class, in terms of academic performance, course rigor and test scores, is better than the previous class." Each class seems to excel more than the last, according to Munoz. "Students with good qualifying records that were admitted seven years ago, fewer of those students are now being admitted," Munoz said. "Not because they are not high quality, just that the applicant pool is that much more competitive. The Rice Admissions office often deals with having to explain to parents why their son or daughter did not get admitted, despite having perfect records. "The issue is we have hundreds and hundreds of that many more students who have outstanding academic records. Then it gets into other factors, in terms of what added value does the student bring to Rice... what they've accomplished in terms of extracurriculars and how they distinguished themselves while in high school," according to Munoz. "So all of that raises the bar." "In the end, most students and families, regardless of ratings and rankings, make the decision based on whether the students values and interests are in line with what Rice offers," Munoz said. This reasoning is also used when Rice chooses its applicants. "What I've told prospective students in the past is that when you write the Rice Supplemental Essay, if you can take the word 'Rice' out and can replace it with, for example,'Cornel', and it still makes sense, it's not a good essay. The applicant (needs to) demonstrate that they really have invested some interest and research (in determining) whether Rice is a good fit for them," Munoz said. "The belief is that you ...are making a conscious decision that is informed, which improves the likelihood that you are going to be satisfied with your experience and that you're going to make Rice a better university. As opposed to someone who is just here and going through the motions." Be careful. Using a template is risky; some students apply to Rice and in their application they'll reference Stanford because they lost track of their essay. Do the research. Applying to a highly selective school is similar to applying for a job; you should know something about the company because if you do get an interview, you want to be able to convey that you invested a lot to understand how you can make the company better. Be a leader. Rice is looking for future leaders, and leadership can be demonstrated in different ways. Work hard. In the end, if a student wishes to attend Rice, they must perform well in high school because Rice is academically rigorous.